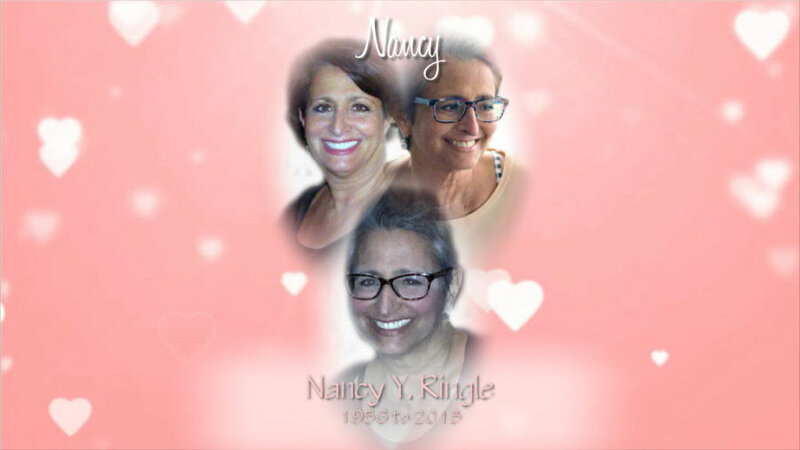 On February 20, 1956, God presented the world with truly one of his most precious gifts, Nancy Youssef Ringle. On June 27, 2018, that gift went back to be by His side as Nancy passed away peacefully surrounded by her family. Preceding her in death were her parents, Eddie and Helen Youssef. Nancy is survived by her husband, Tim Ringle; sons, Jason Fahrer and Zachary (Haydil) Fahrer; granddaughter, Taryn Tucholski; grandson, Alex Gorvoy; brothers, Gary (Julie) Youssef, Rick (Andrea) Youssef; sisters, Sharee (Tom) Youssef, Lami (Mike) Coyle, Lori (Doug) Smith and Diane (Jim) Forrester and sister-in-law, Peggy Youssef. Nancy also leaves behind so many nieces and nephews who adored her beyond words and dozens of best friends, who were so good to her. Nancy's passions for life, love and happiness were evident in everything she did and her ability to befriend any and everyone was unmatched. She loved to cook, eat, fish (even though she never caught anything), travel, play the slots and generally everything to do with life itself. More than anything, she loved her two sons, her husband and her four sisters. You cannot hear the song, "We are Family" and not think of Nancy! She truly made everyone's life better by being in it. The family would like to give a special thank you to the loving and caring nurses at Hickman Center, as well as to Nancy's dear friend and Oncologist, Dr. Tim Kasunic. There will be a celebration of Nancy's life on Saturday, June 30th from 11 a.m. - 3:00 p.m. at Reeb Funeral Home in Sylvania followed by a gathering for friends and family at a family member's home for further celebration. In lieu of flowers, the family asks that you make donations to the Victory Center or The Leukemia Foundation.